Jarrett Little was biking through the mountains with his friends when they stumbled upon the little puppy. Every dog has its day. But for a young puppy lost in the woods, his life was made when he ran into a group of mountain bikers. Jarrett Little was with a group of fellow cycling enthusiasts when they crossed paths with the puppy. The dog appeared out of the woods when the cyclists were regrouping. "He was really thin, ribs showing and had a lot of road rash and a broken leg," Little told CBS News, who reported the story. After feeding the little guy some food and water, the cycling group began to brainstorm on ways that they could transport the injured dog. Jarrett didn't have a car to transport the pup, so he compromised: he hoisted the pup onto his back, and rode into town looking for a vet. At the vet's office, Jarrett ran into a woman who showed an interest towards the injured puppy. Andrea Shaw not only helped Jarrett with the puppy's medical needs, she also decided to take the luck puppy home. The dog managed to find a forever home thanks to his running luck. "She paid for him to have his leg repaired with surgery and found an organization that could help get him back to Maine to live on her horse farm," Jarrett told CBS. Andrea named the little guy Columbo, in honor of the city that he was found in. Andrea, who was in town on business, immediately called her husband to ask him if they could bring Columbo, or 'Bo', home. She offered to pay for his surgery and also arranged for Bo to be transported to Maine. Bo now lives on a little horse farm with his big, happy family. The internet is so happy that little Bo found his forever family. 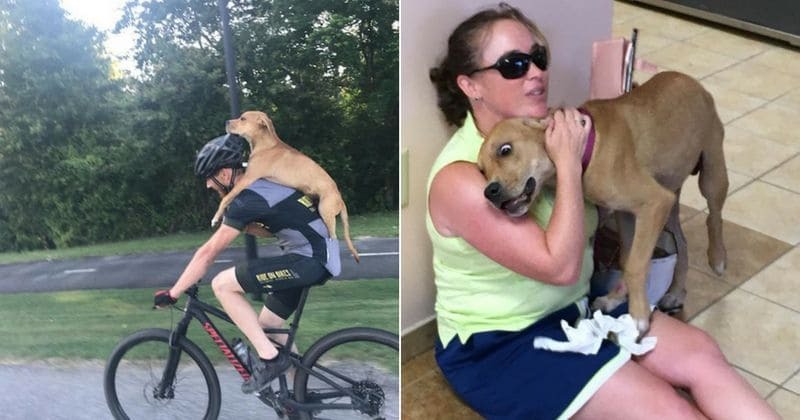 The picture on Bo riding piggyback with Jarrett went viral, and the puppy garnered so many fans online that Andrea created a page for the famous Bo called 'The Adventures of Columbus'. Very sweet. If only more people were like him.